One can see from different illustrations in the Vatican Virgil 3225 - fourth century - ships that answer to the description of a liberna from the previous blogpost. These manuscripts are early medieval copies of originals that were executed in an 'antique' style. Therefore they can show ships of a time before their date of execution. In the fifth century, for example, writers could not explain what a ram was, the spur was by then used on warships, but artist still drew a ram. Detailed study has shown that the copyists were extremely diligent in their work. They even tried to use the same brush and pen strokes as the original artists. The overall form reminds of the Trajan's Column ships. 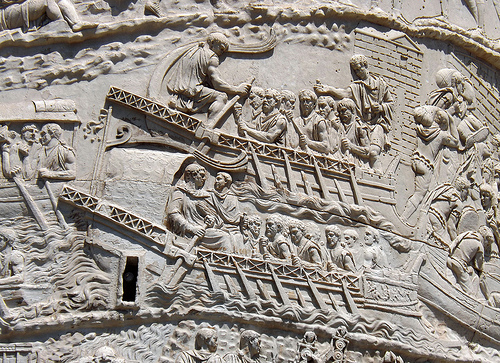 Many smaller galley depictions of AD date seem to show the upturned forefoot as seen on Trajan's Column. Whether this is truly a ram has been debated. It seems to ultimately morph into the spur of a dromon. It could be that we see a lighter ram/spur forefoot which was mainly for running down smaller vessels. 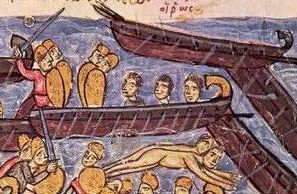 Instead of impaling smaller vessels they would be run over and/or capsized. Ther eis also a proembelion which argues for an intended rolling of the target. In the later MSS3687 - fifth century - Aeneas' ships are proto-dromoi and have a spur, not a ram. They have a chain supporting them. The spur was a long structure requiring support. The weight and speed of the attacking ship sank or over-turned the targetted ship. Spurred dromoi over-turn baddy ships. 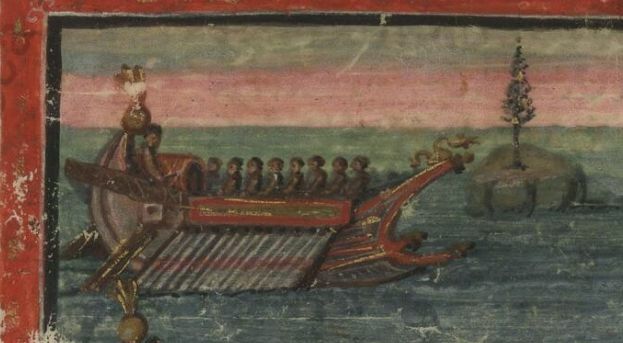 MADRID SKYLITZES,11cen. The deck is not considered by the artist when he wants to show the ship under oars. He shows the oarsmen working but they sit too high. A mosaic from the third century Tunis is very similar. Now the artist will show the ships manned for fighting. The troops must be on a deck and now the oarsmen are invisible. This is probably the best depiction of a liburna in combat apart from the rig being in place. The sails are not full, maybe they are being taken down. 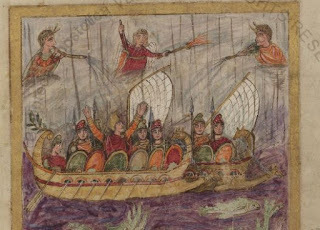 Another folio of the same MSS shows ships drawn in another style. All the details of a liburna are present and one can see the men on deck are not oarsmen. The deck is in place and the oars are out. 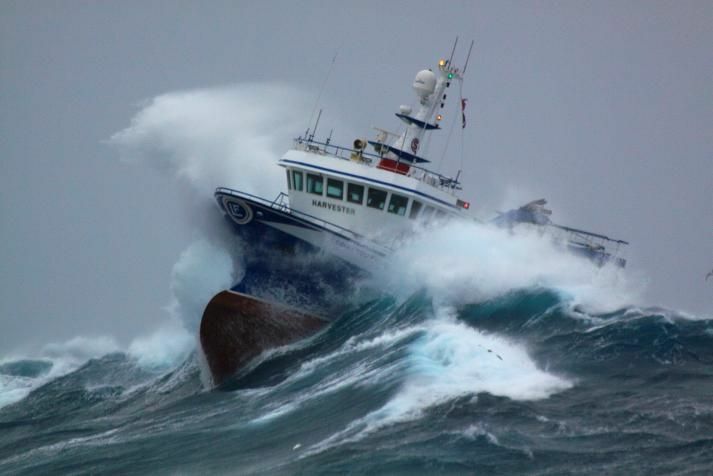 "Come away fellow sailors. Your anchors be weighing!" What was a 'liburna' and what did it look like ? 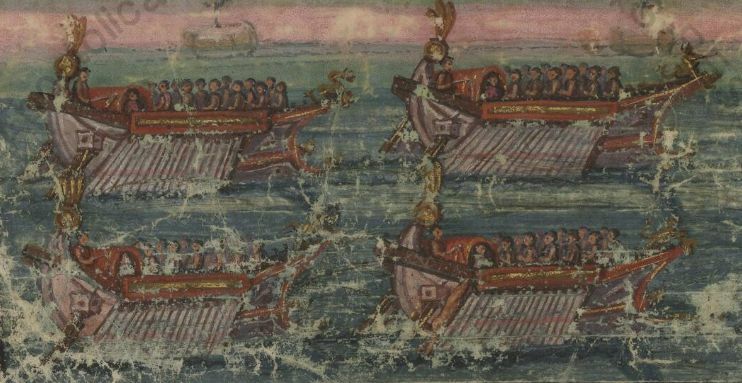 A lot of books declare that the Romans shifted to just using a ship type called a 'Liburnian' after the victory at Actium, whereafter the Mediterranean had become 'mare nostrum'. However, as one can see from the latest Osprey offering, New Vanguard 230, there is uncertainty about what exactly a Liburnian was. 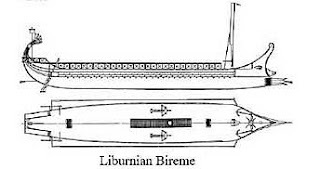 'Liburnian' is a common noun for a ship type. It does not imply all Liburnians were exactly the same. A modern equivalent would be a 'Northumbrian Cobel' or a 'Brighton Hog'. It was a type that had its origin with a recognised form from a specific area. Liburnia is a region of Dalmatia with a myriad islands. In the ancient world it was pirate territory and the channels and islands gave cover for ambush and escape. 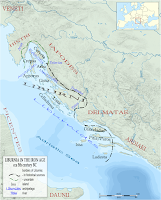 The Liburnians were the first area of Illyricum subdued by the Romans, hence their close relationship. The piratical tribe of Liburnians must have had a ship suited for their profession. It was a small galley. Small, because it needed to be handy and pirates tend to operate in small groups. A Three needs 200 men to get around. It would need the men from several rural settlements to man one. And where would it be hidden or maintained? There are some candidates for what the original Liburnians may have looked like on an engraved gravestone from Novilara in Italy. 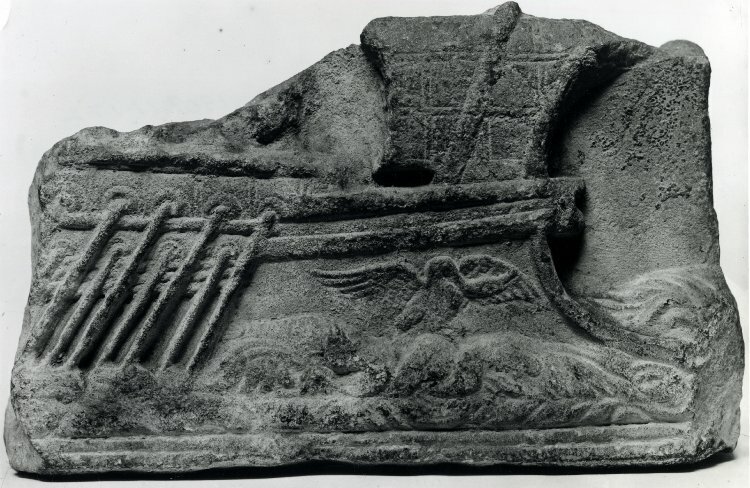 It dates to the sixth century BC and purportedly shows Liburnian and Picenian ships. There seems to be no difference between the ships shown. Archaic features on the ship combine with a waterline ram which looks wierd. In addition, the dating of the stele is circumstantial - it was a loose find about which nothing is known. A fake ? A misattribution ? Unfortunately we cannot use these ships as a model for a Liburnian. 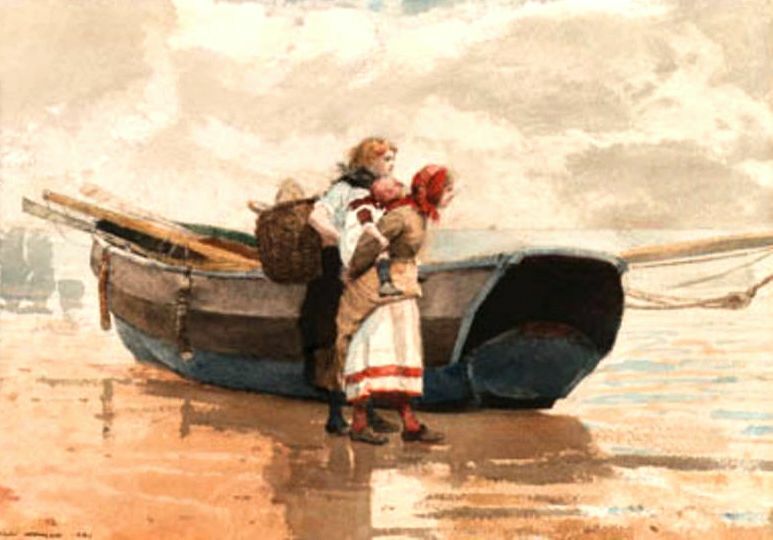 This animal attacks the balænain in its places of retirement, and with its teeth tears its young, or else attacks the females which have just brought forth, and, indeed, while they are still pregnant: and as they rush upon them, it pierces them just as though they had been attacked by the beak of a Liburnian galley. 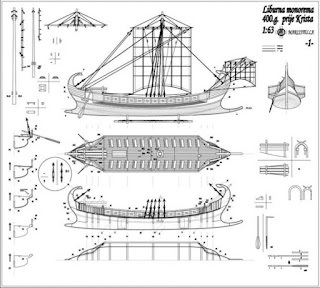 The Liburna, or Liburnica, was usually a bireme, or two-oared galley, with the mast in the middle, though sometimes of larger bulk. From the description given of these by Varro, as quoted by Aulus Gellius, B. xvii. 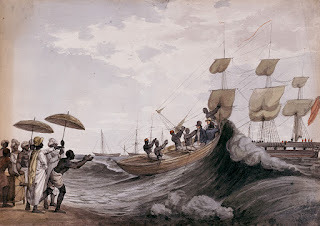 c. 3, they seem, as it has been remarked, somewhat similar to the light Indian massooliah boats, which are used to cross the serf in Madras roads. Pliny tells us, in B. xvi. c. 17, that the material of which they were constructed was pine timber, as free from resin as it could possibly be obtained. The beak of these vessels was of great comparative weight, and its sharpness is evidently alluded to in the present passage, as also in B. x. c. 32. 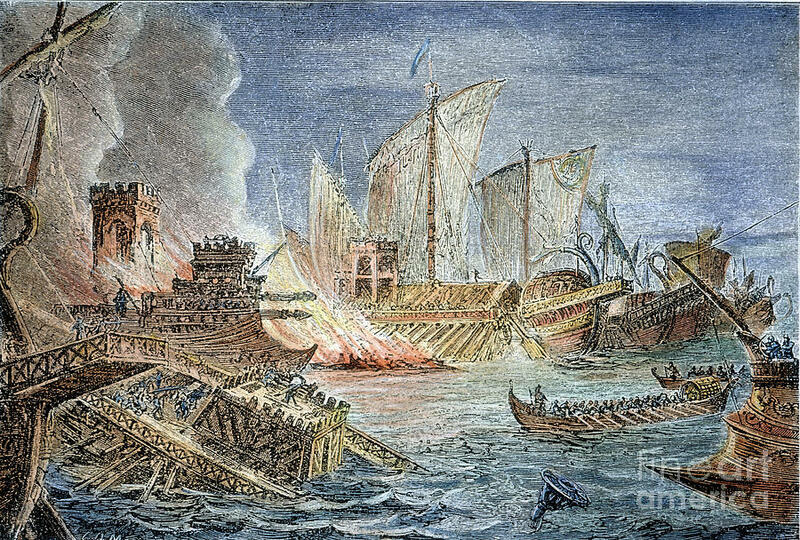 The term "Liburna" was adopted from the assistance rendered to Augustus by the Liburni at the battle of Actium. 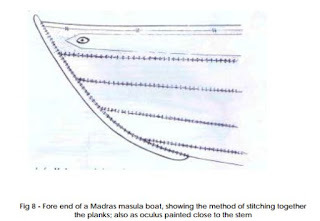 Here we should digress to look at a truly wonderful craft.The masooliah boats were deep-hulled wooden boats of sewn construction used to ferry goods and people ashore on the ocean coast near Madras. 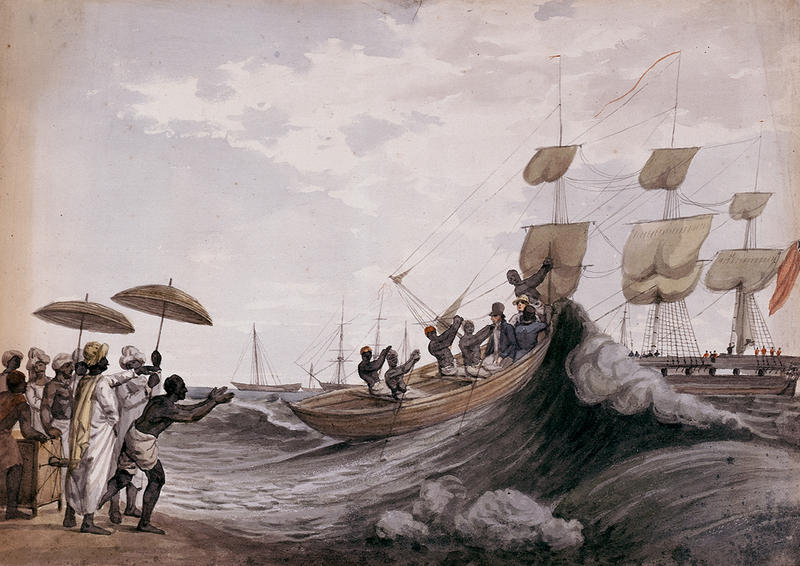 Bostock may himself have risked life and limb to come ashore through the surf at Madras on a 'masooliah boat'. Bostock, from Liverpool, was a President of the Royal Geological Society, MD who first described Hay Fever, and still found time to translate Pliny ! Europeans come ashore at Madras : The Masooliah Sleigh Ride ? 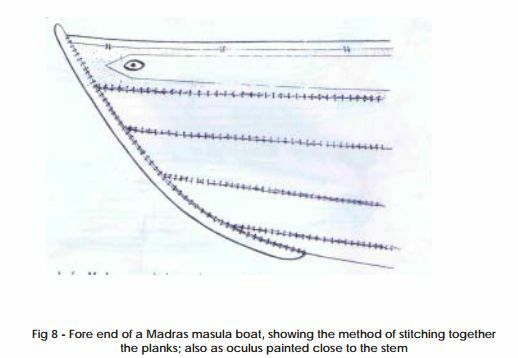 Masooliah boats have a nice connection with ancient galleys. They were handcrafted by artesans and sailed by thoroughbred seamen. 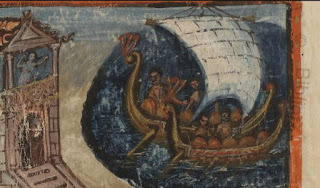 The prows of the boats were decorated with apotropaic eyes. 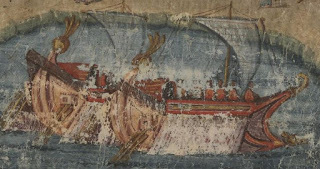 During the Punic Wars Polybius tells us that it was usual for lemboi to scout ahead of the fleet. Lemboi were light galleys - another generic name for a type. Appian uses the term Liburnian for the same function, describing the same campaign. 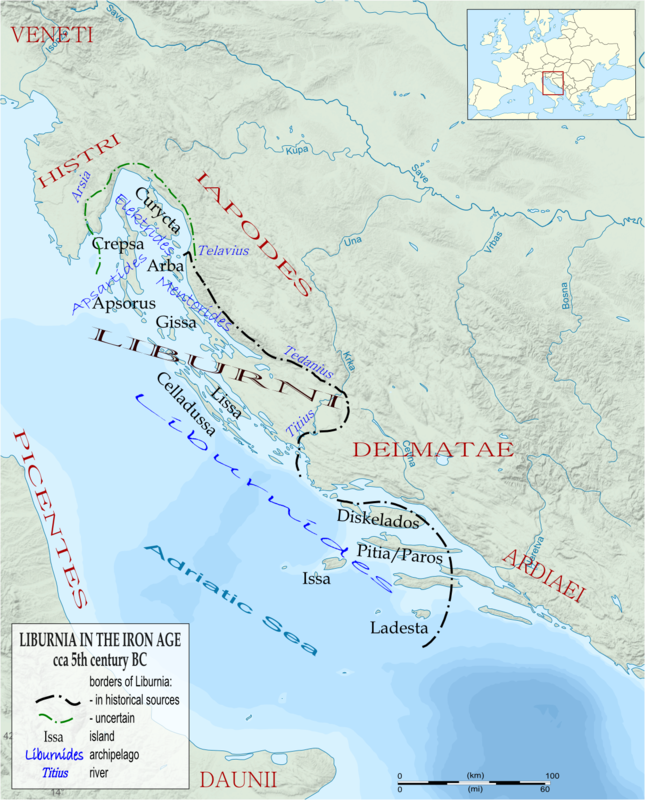 The Liburni, another Illyrian tribe, were next to the Ardiæi as a nautical people. 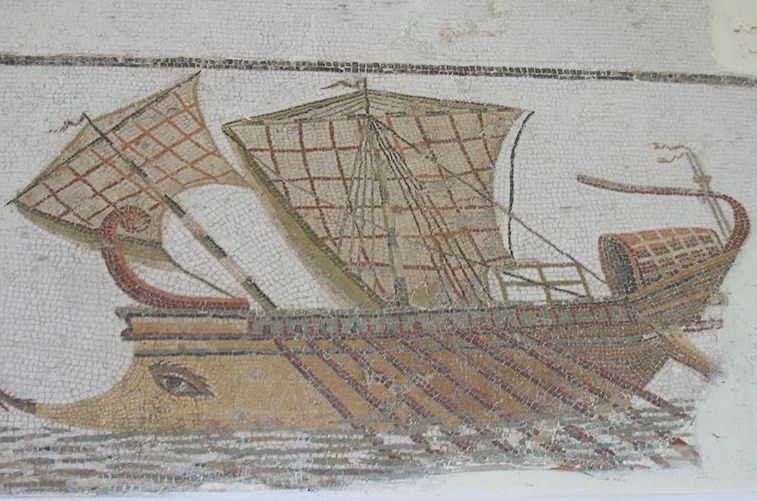 These committed piracy in the Adriatic Sea and islands with their light, pointed (oksea) fast-sailing pinnaces, from which circumstance the Romans to this day call their own light, swift biremes (dikrota) liburnidas. 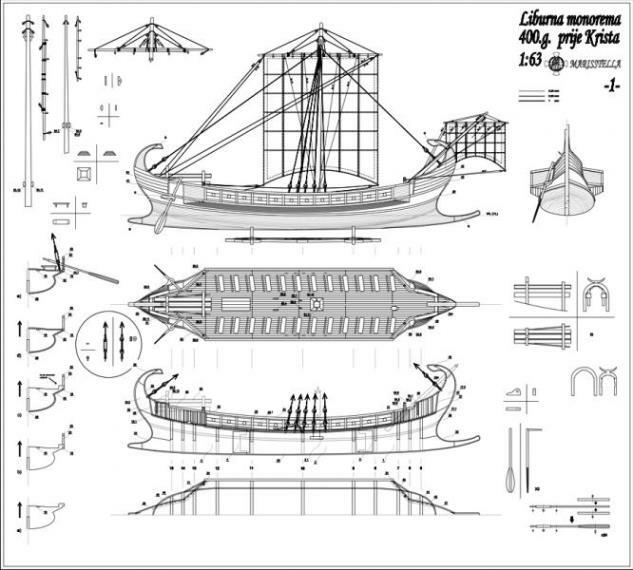 Plutarch, Cato the Younger 54.3 -Liburnians are grouped with other fighting ships as cataphract. 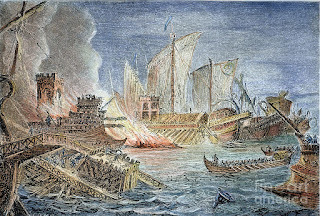 Actium : 19th Cen view : Liburnians ? 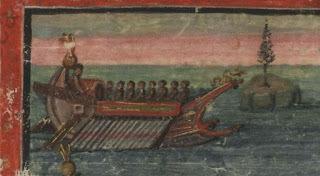 From Imperial fleet lists we know that Trajan's Moesian flotilla had a Three as its flagship. Thus implying the liburnians which formed the rest of the unit were lesser in size. 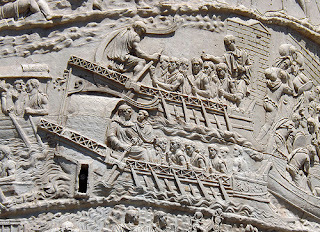 Trajan's column has somewhat compromised depictions of what are probably Liburnians. 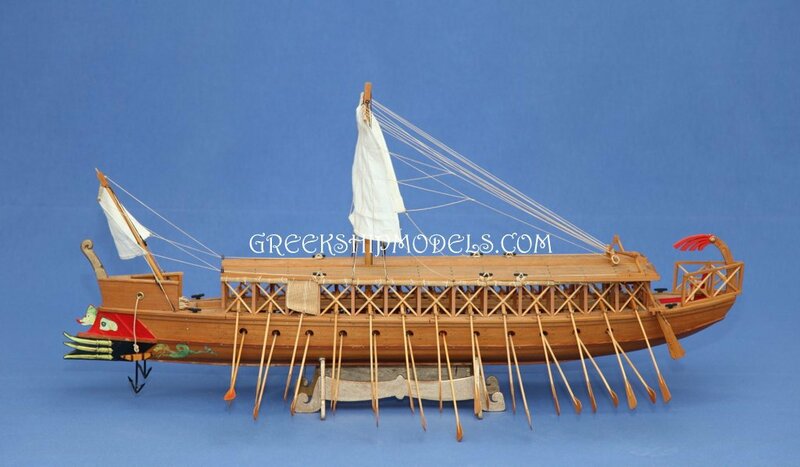 Men are too big, ship should be decked, upper oars worked from ports below the lattice. From a later date, the 10th century we have 'The Stronghold' or Suda which is a massive Latin dictionary. This was compiled using all available literature at the time, including material from BC we no longer have access to. 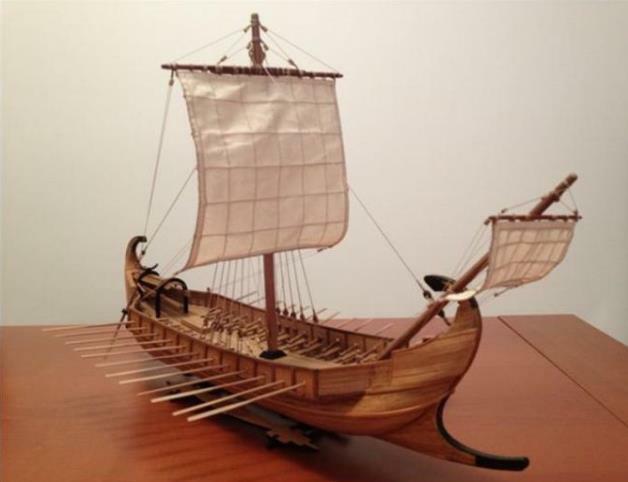 L496 Ships [which] did not have the form of a trireme but were instead rather piratical: brazen-beaked and strong and armoured, and unreliable in respect of speed. L490 "[He] having built thirty-oared runners after the model of Liburnians". The balance of this pot pourri seems to be that a Liburnian was a galley with up to 50 oars. It was light but it was capable of fighting. so it was decked and the sides could be closed to protect the oarsmen. It had a ram and its bow was very pointed in shape. It is interesting to note that these characteristics equate with the Three's predecessor - the dikrotic pentekonter / 'bireme'. This was a crucial niche, apparently, in the ecosystem of ancient galley warfare. An agile smaller warship with a reduced crew, easy to maintain and suitable for a range of roles. John Coates reconstructed a Liburnian in 1994 as below. 18 x 3m at waterline. 50 oars. Decked - 2m above water, 5 to 30 fighters. There is a tendency in some books to elevate the Liburnian to a wannabee Three. e.g. John Warry's nice book Warefare in the Classical World. Liburnian from John Warry's book as copied in Osprey NV225 : It is the wrong size - has a strange oar arrangement, is not fully decked, cannot be a Liburnian nor is it a dikrotic pentekonter. But it is from 1980! This is not necessary. Rome still had Threes in its fleets all through the Imperial period as well as the manpower-efficient, handy Liburnian. 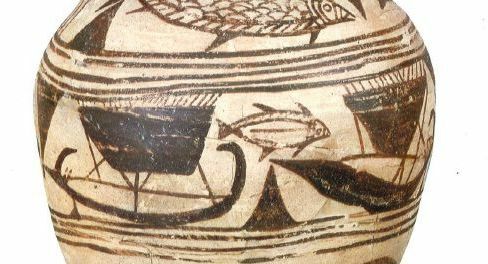 A Liburnian could catch and fight any 'native' or piratical craft likely to be encountered in Roman waters. Decked - this means a continuous deck over the oarsmen. Could have a light railing. After Roman practice there could be a shelter in the poop. The focsle could be built up to deck height or open. Such a small ship could not mount a tower. Within these limits we could have a Liburnian with 30 oars, a Liburnian which was not decked-over to be used as a courier, a Liburnian with a single row of oars - but this would have to have 30 or less oars to keep the length down and more than 24 or it would have not enough power to do anything, it would still probably not be worth putting a ram on such a weak ship. If the Mainz ships HERE could mount bolt shooters then so could a Liburnian. Meanwhile, over at Greekshipmodels.com there are some nice reconstructions of Liburnian type ships. 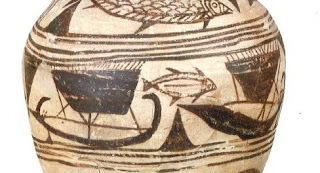 Further to my ramblings about odd Etruscan ships (and HERE) I have located another analogue of the 'galley versus freighter' scene from the' Aristothonos Vase' depicted by on Periklis Deligiannis' blog HERE. This time it is a smaller version. On a little jug (oenochoe) by a painter known for using a palm tree motif - 'The Palm Tree Painter'. He worked in Etruria in 700-675BC. The juxtaposition of a slim galley with a more massive freighter is here. Neither ship has crew nor oars. The limited space compared with the large area on the Aristothnos vase could explain this. The 'freighter' has a wierd massive prow which is not identical to that of the Aristothonos ship but is is strongly reminiscent. The painter meant to show something here but was maybe uncertain what exactly it was (a common feature of Italians depicting ships ?!). In connection with trying to work out exactly what the uncertainty was, I found a comment in a paper about early Etruscan ships by Marco Bonino (SARDINIAN, VILLANOVIAN AND ETRUSCAN CRAFTS BETWEEN THE X AND THE Vlll CENTURIES BC FROM BRONZE AND CLAY MODELS in TropisIII, 1995) that supports my first impression that it is not a ram as such but a depiction of a cutwater - a building-out of the prow to make the ship sail better in waves. Aristothonos prow and analogues from Bonino's paper. Again, we have a case where the artist is not giving us a replica but an interpretation of a real ship. There are many small potttery ships, for example, from early historical times but to try and build ships from them would be a crazy idea. 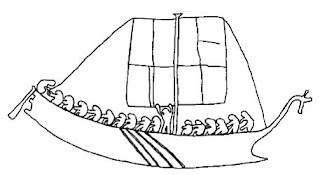 A longship's cutwater or 'forefoot' will be a downward pointing curve because the ship's bow is lower on a lighter. slimmer ship designed to be powered by oars. Whereas a round ship or freighter will be equipped with one that follows the bow up to split the waves. 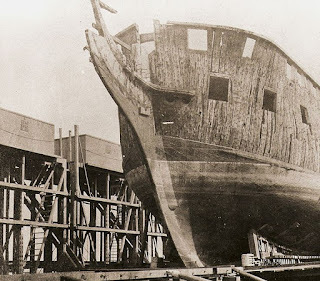 Building a downward curve would involve a complete rebuilding of the bow which, on a deep-hulled sailing ship for carrying a large load of cargo will be high and broad.